Description: From the critically acclaimed author of Allegedly, Tiffany D. Jackson, comes a gripping new novel perfect for fans of E. Lockhart and Gillian Flynn about the mystery of one teenage girl’s disappearance and the traumatic effects of the truth. My Thoughts: This is a story of a girl who is looking for her missing friend. Claudia and Monday have been best friends since first grade but, when Claudia returns from a summer spent with her Grandmamma in Georgia, Monday is gone. They had big plans for this eighth grade year and Claudia can't imagine spending it without her best friend. The main problem is that no one else thinks that Monday's disappearance is a problem. Claudia's mother says maybe she's sick. The school says she never enrolled. And even Claudia's favorite English teacher isn't able to get any answers when she questions the school or social services. Claudia keeps trying to call but the number is out of service. 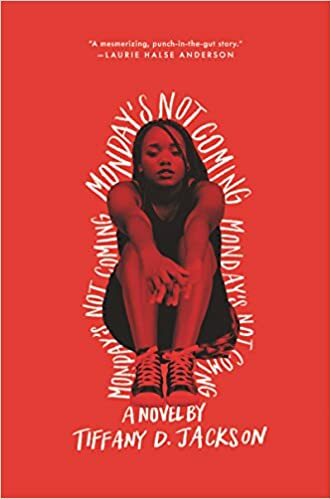 Despite the fact that her mother doesn't want her to go to Claudia's neighborhood which is the most dangerous in Washington, DC, Claudia doesn't find out anything when she talks to Monday's mother. Monday's older sister keeps giving her conflicting stories, i.e. that she's home sick, that she is living with her father, that she is living with an aunt. Claudia really needs her friend at school. She is dyslexic but has been able to cover it up because Monday has been doing her writing for her and reading to her. Despite her learning disability, which she will do anything to hide, she is a talented dancer who has been moved up to a higher age level at her dancing school and talented as an artist which mainly shows up in the creative way she does nails. The story is pretty straightforward and doesn't have a happy ending but the writing style adds depth to the story by shifting around in time with each chapter. Here are the first four chapter titles so that you can see what I mean: September, The Before, The After, One Year Before the Before. I was right there with Claudia feeling her frustration as she couldn't get anyone to care as much about Monday's disappearance as she did. The story was horrifying, heart-breaking, and the kind of story that will haunt my thoughts for a long time. Rumors are born with legs that can run a mile in less than a minute. Rumors eat up dreams without condiments. Rumors do not have expiration dates. Rumors can get you killed.